Ampangalana "where one takes charge of"
It's not always easy to continue what nature has so well begun. Along the rectilinear eastern seaboard there are lakes, rivers and mouths that theoretically it would be enough to connect with each other to obtain a practical and secure waterway because sheltered from the moods of the ocean. From 1898 four years of work were necessary to open the first stretch of Ivondro to Andevoranto. In 1913, the competition of the railway that followed the same route until Ambila before making an elbow in the direction of the interior did not succeed in stifling the ambitions of a "great" Pangalanes continuing straight to the South. The complete folder of piercing from end to end was finalized in 1925 and received some concretisations as the budgetary releases by the colonial authorities. Paradoxically, the Second World War was beneficial to the work of the Canal because it was necessary to palliate the scarcity of the boats that can serve the East Coast. After Independence, financing difficulties persisted, but important work could be undertaken between 1984 and 1991. Over time, the real problems of the Pangalanes proved to be water hyacinths, eucalyptus branches blocking in some places the entire width of the Canal, sandbanks, and sometimes also industrial waste. 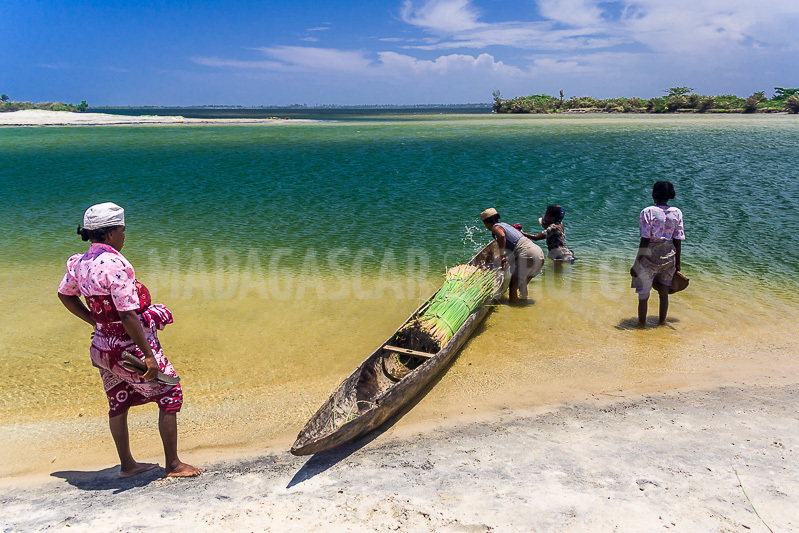 Of the four dredges acquired by the State in 1981, the one allocated to the Pangalanes, which was immobilized at Analampotsy near Mananjary, was the subject of major rehabilitation work in 2005 supported by the Chemonics Program and the Business And Market Expansion (Bamex) . Its re-use is entrusted to the Maritime and Fluvial Port Agency (APMF). The approximately 150 mi between Tamatave and Mahanoro will be among the first to benefit. • Mananjary, a small quiet town at the crossroads of the river of the same name that spans a suspension bridge Eiffel, and of the Pangalanes Canal. The sea is rather rough, so it is preferable to look at it wisely from afar in the shade of the filaos. The Canal by cons is passing, with canoes sometimes twinned to make a raft. The river station is a very lively place where fishermen, market gardeners, and wooden merchants meet. • The Andragnazavaka bay and Lake Mahela near Anilavinany. It was here that Jean Laborde, the future great industrialist of Queen Ranavalona I, was shipwrecked in 1831. Two anchor chains were discovered there in 1997, in perfect condition after having lived a century and a half underground. • The "wild boar stone" (vatolambo), religiously preserved in the Village of Ambohitsara near the mouth of the Fanantara. His back dug in receptacle receives the offerings and the gifts. Does it come from Mecca or another version of the Mangalore? The chloritoschist in which it was worked exists in the area where it has been used extensively for cooking pots. Failing to bring her with them, it is more likely that the Arabs have carved it on the spot according to their tradition. The stone, moreover, resembles an elephant, an animal unknown to Madagascar, than the boar, to which it has always been compared. • Nosy Varika, a small picturesque village but which has the annoying mania of often putting itself on the trajectory of cyclones ... The highest falls of Madagascar those of the Sakaleona (660 ft) are some 62 mi to the West. Those who have been able to approach this jewel are still rare, the access being particularly difficult. • Akanin'ny Nofy or the "nest of dream" is located on a peninsula of about 35 ha bordering the third largest lake of the Pangalanes. It had its heyday in the 1960s when it was a presidential resort on the one hand, and regularly served by the train on the other hand. Since nature has resumed its rights, and it is precisely for this impression of being cut off from everything that Akanin'ny Nofy has his fans. It relearns simple pleasures, and the hospitality is excellent, everything ... simply! Here begins one of the most beautiful portions of the Pangalanes Canal with its succession of lakes, the harrows of the shrimp fishermen, a vegetation with sometimes "green hell" in soft version, the buried villages that one would think is enough to themselves if there were the canal linking them to each other and with another "universe", Tamatave, one of the two main ports of the canal with Mananjary. Tamatave, the economic lung of the Big Island where come alongside cargo ships and container ships from all over the world, also a holiday town that knows how to take the nonchalant rhythm of its "bazary" (market), big and small, and its rickshaws.